As a seventh-grader, Emily Herman decided to learn every language in the world. She and a neighbor mastered saying "hello" in 13 of them before realizing the impossibility of the goal. Although she didn't complete her daunting task, Herman did discover a love of language. In the years since, Herman, who graduates June 8 from Wilmington High School, found she had a natural knack for foreign tongues, and for helping others learn. 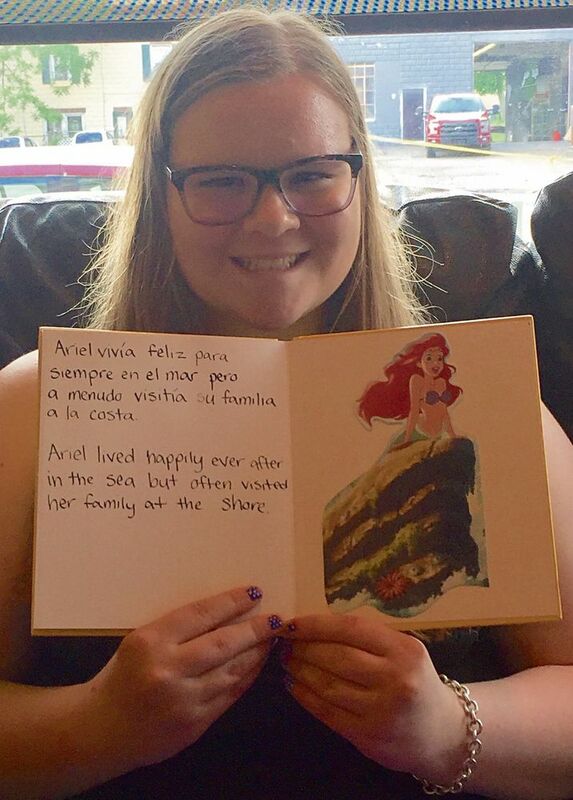 Starting formal classes her freshman year, Herman found Spanish "ridiculously easy." So, she added French at Wilmington as well as German and advanced Spanish classes at Westminster College. During her junior year, when Herman learned Wilmington Elementary's English as a second language, or ESL, class was English only, she set her sights on providing lessons in Spanish for the students. "I'd written a paper and done research on the benefits of using both languages in the classroom. Using English only discourages their native language and diminishes a part of their identity," explained Herman, who helped three youngsters who spoke only Spanish as well as another whose first language is English but who wanted to learn Spanish. Working each day, for anywhere from 30 minutes to two hours, Herman provided her young charges with creative language lessons using games, puzzles and stories. Together, they've written books and worked on math problems. Origami and a lesson on Helen Keller complete with Braille found their way into the lesson plans Herman created herself. "They're doing well. It's a good environment for them," Herman said, crediting the elementary's ESL teacher Tawnee Hunter and high school language teacher Mary Beth Acker for their help. Wilmington guidance counselor Taryn Powell called Herman "a true leader and success story of what hard work can do." Putting more than 150 hours into the ESL program over her junior and senior years allowed Herman to skip a level of Spanish. "I got out of Spanish to do even more Spanish," laughed Herman who plans to major in Spanish and French at Penn State University after taking a semester off to pursue internship possibilities while staying with her grandmother in Staten Island, N.Y., where she spends every summer. Although she's not 100 percent certain, Herman sees herself becoming a teacher or translator. Back at Wilmington, her friend, rising senior Zoe Brown, plans to follow in Herman's footsteps, helping in the ESL classroom. "People might not realize it, but there is a pocket of people here in New Wilmington for whom English is a second language," Brown said. "Working with the kids in their own language helps them destress a little." Herman has also offered to continue helping as much as possible. "Not only are (the students) learning, it's a way for us to learn from them, too," she said. "Language is a big part of a person's culture. Not letting someone use their native language, to me, I just don't think that's right."